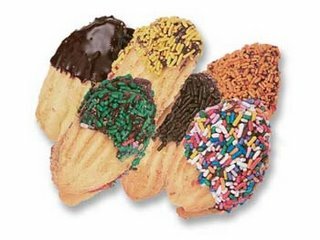 i've been having the craziest cravings for these italian cookies and was finally able to find them today at a little deli/bakery in chelsea... mmm i've been muching on them all day! they've got the most delicious jam filling... and my favorite part -- the sprinkles! sprinkles instantly make anything taste better!! except.. food that shouldnt have any sprinkles on them. so you gotta figure.. its really easy for me to post up pretty pictures of clothing, shoes, and bags that i want every day. there isnt a day that passes that i dont find something new that i want. sooo... when some time passes in between entries... i must be up to no good, i.e. saving money. hahah, just kidding! saving money is good! i really should be more serious and diligent about it. these are kinda... interesting! i cant decide whether i love them or hate them. they definitely are a very loud fashion statement and one could pull them off with a more understated outfit... but i can also see them looking completely horrifying, screaming "what was i thinking?!!" i want to try them on. just for kicks. I need to see those shoes on someone before I can decided whether I like them or not. Shoes on feet and shoes by themselves are very different. I can decide right away that I hate that shoes...Even if someone happens to give it to me free, I would say "No, thanks!" On second thought, maybe i'll take it and sell it on Ebay if there is someone wants to buy it. Later! Wow, those cookies look divine. 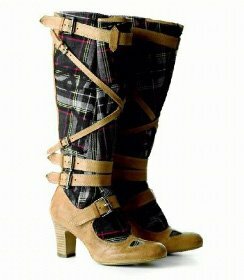 You're right, those boots are very original, but I, for one, couldn't carry them off. I think you need really long thin legs and a bitchy attitude to go with. Maybe they'd look good on Paris? Did you just say those cookies look "divine"? 1. of or pertaining to a god, esp. the Supreme Being. First off, god doesn't exist. Second, if he did he would be too busy to make cookies.